Our Class 101 custom injection molds are designed to perform consistently over the course of millions of cycles. We focus on high-production, fully-hardened molds for parts small enough to fit in the palm of your hand and multi-cavity molds that fit up to a five-hundred-ton press. We can produce both single-cavity molds and multiple-cavity molds. 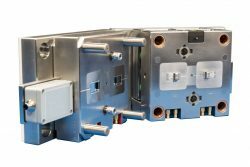 We have both the capabilities and the expertise required to create interchangeable cavity molds. Both the impressions and the blocks are interchangeable, ensuring you don’t have to take an entire mold out of production if there’s a problem with a block. This saves our clients on time and production costs for years after the mold is delivered. Whether your custom injection molding needs involve medical device manufacturing, medical disposable products, surgical products, microelectronics or consumer products, we can develop an injection mold solution for you. We invest in cutting-edge technology and create cost-effective custom processes that allow us to offer high-quality solutions to clients looking for complex molds solutions. Our capabilities allow us to work across industries, creating molds for clients ranging from medical device developers to microelectronics manufacturers. Mold Craft’s commitment to client satisfaction and a collaborative mold making process allows us to create molds that work correctly the first time around. Long-lasting quality is our priority for every mold we make. Customer satisfaction is important to us at Mold Craft and we know there’s one way to achieve it — by getting things right the first time, and creating a cost-effective design and production process. Contact us today for a custom injection mold that fits your needs.